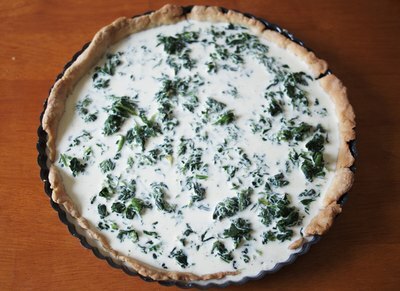 A spinach quiche featuring creamy custard with emerald green specks and a buttery crust is appropriate for a garden party, a brunch potluck or even a rather ordinary Tuesday night dinner. This nouveau food of the '70s, which wasn't eaten by "real men" until the '80s, is really just a savory tart of French origins. A quiche isn't complicated to make, and homemade versions far surpass frozen or store bought varieties. For the easiest variation, skip making the tart dough from scratch and go with a purchased shell. Place the flour, salt and sugar in a medium bowl. 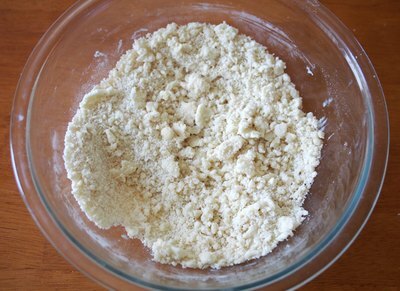 Cut the butter into small pieces, and, using your fingers or a pastry cutter, work it into the flour mixture. The mixture should resemble coarse meal with pea-size bits of butter throughout. Stir in the egg yolk and milk using a fork. 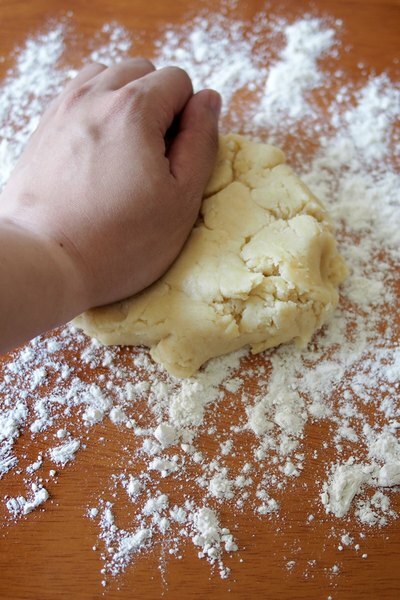 Blend thoroughly to create a rough, shaggy-looking dough. 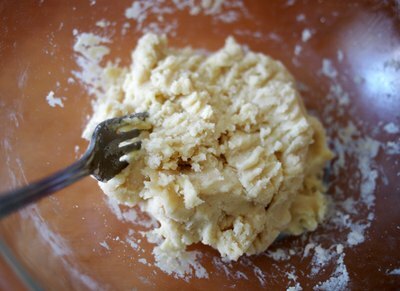 Turn out the dough onto a floured board and work it with your hands to blend the butter in more thoroughly. 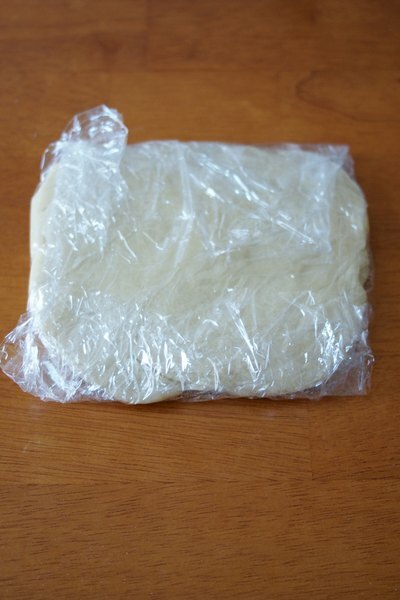 Form the dough into a flat disc, wrap it in plastic and refrigerate it for at least one hour. 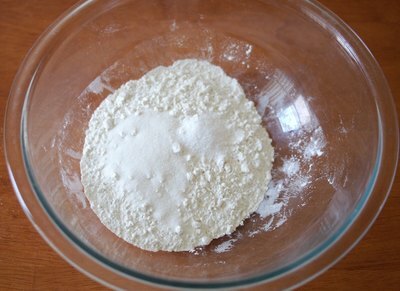 Remove the dough from the refrigerator and turn it onto a floured work surface. 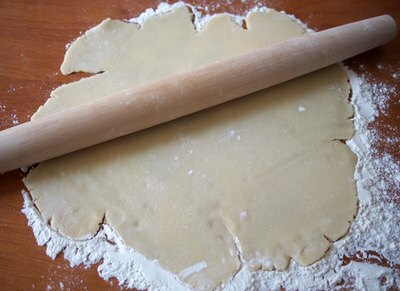 Using a rolling pin, press the dough into a circle that’s approximately 12 inches wide and 1/8 inch thick. Press this circle of dough into a 10-inch fluted quiche pan. Trim the top edges of the dough, but leave a ½-inch overhang to crimp and allow for shrinkage as the crust bakes. Cover with plastic wrap and place in the refrigerator for at least another hour. Preheat the oven to 350 degrees Fahrenheit. Remove the crust from the refrigerator and unwrap. 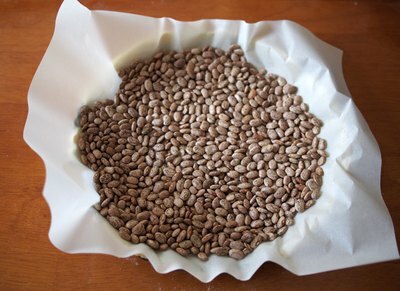 Place a layer of parchment paper over the tart shell and fill it with dried beans or blind-baking stones. Blind bake for 40 to 45 minutes, or until the crust appears golden. Loosely apply foil to the fluted edges if they start to overbrown. Remove from the oven and cool it for 20 to 30 minutes, or until it reaches room temperature. Pour out the beans and remove the parchment paper. 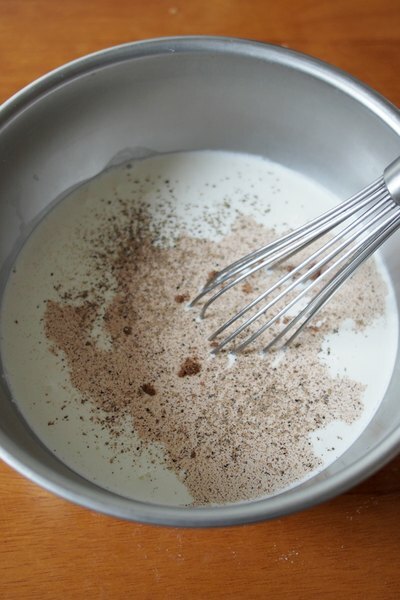 As the crust cools, whisk together the eggs, cream, whole milk, nutmeg, salt and pepper in a large bowl. 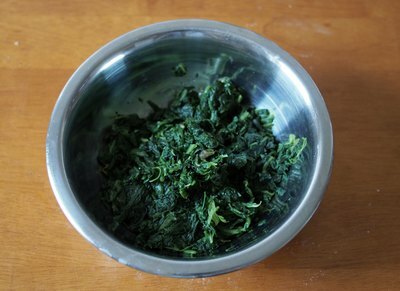 Squeeze any excess moisture out of the cooked spinach and chop finely. Place the baked pie shell, still in its pan, on a baking tray. 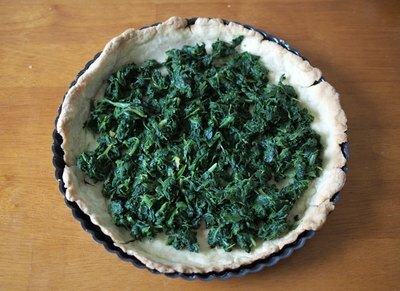 Lay the spinach evenly over the baked pie shell. Pour the egg mixture on the top. Cover the edges of the tart with foil to prevent burning.Slide the entire baking pan into the oven and bake for 45 to 50 minutes, or until the custard is set. Cool for at least 30 minutes before serving, or the quiche may fall apart when sliced. 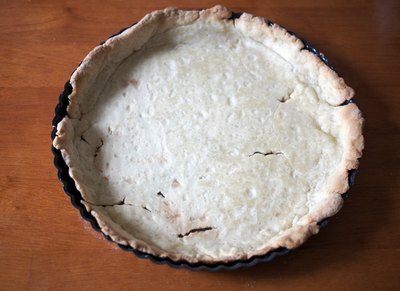 Refrigerate unrolled tart dough for up to a week or freeze unrolled tart dough for up to a month; allow it to thaw at room temperature before proceeding. 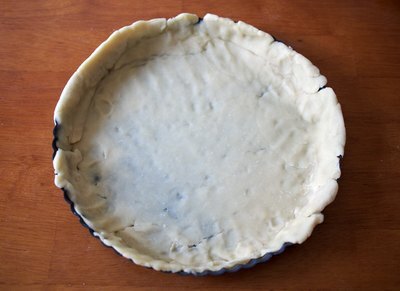 Once rolled out and placed in a pan, the tart dough may be frozen for two weeks or refrigerated for two days. Thaw for 30 minutes at room temperature before blind baking. To save time, use a premade tart shell. Blind bake it, though, to prevent a soggy crust. 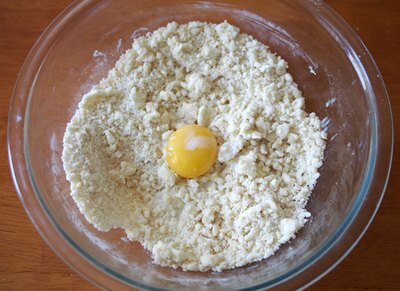 You may add up to 1 cup of cheese to the egg mixture. 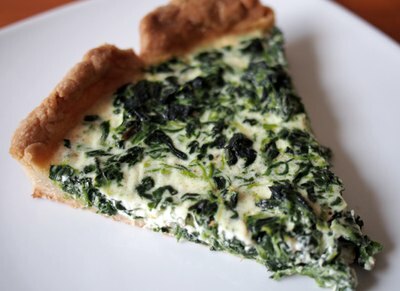 Monterey Jack, Parmesan, mozzarella, Swiss and cheddar complement the mild flavor of the spinach. Chopped ham, minced onion and chopped red bell pepper are other possible additions.